Carrots being connected to the eyes is pretty common knowledge. We eat a lot of them because they are sweet and it’s easy to see the resemblance when you slice them up. 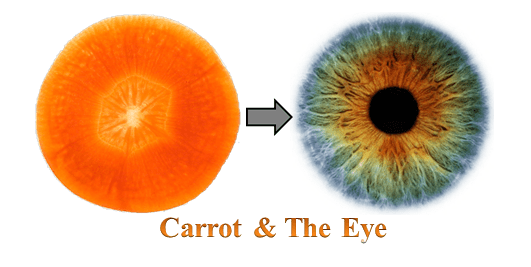 As you can see in the picture below, sliced width wise, the carrot looks like the colored part of the human eye. According to scientific studies, eating carrots greatly enhances blood flow to the eyes. Enhancing blood flow means more nutrients are being carried to the eyes so they can function more optimally. Additionally, nature provided just the right nutrients in just the right proportions to give our eyes just what they need without excess and waste. This process has been developing for millennia! Carrots gets their orange color from a plant chemical called beta-carotene, which reduces the risk of developing cataracts. 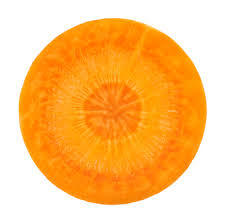 Beta carotene is the precursor to Vitamin A and protects the cells of eyes from free radical damage. Vitamin A is essential for good vision but in too high a concentration can be poisonous for the human body. Nature designed it so that we get beta carotene, store it, and as we need Vitamin A, the body releases and converts just the amount of beta carotene to convert to Vitamin A that the body needs and keeps the rest stored for later. The human body, in conjunction with natural design, is an amazing efficient system. If we would just take the time to learn about it and how to work with it we would have a much better go of getting and staying healthy! Grind carrots in food processor until fine then set aside in large bowl. Grind walnuts in food processor until fine then place in bowl with carrots. Blend dates in food processor until smooth then add ginger, cinnamon, cardamom and nutmeg and blend well. Slowly add carrot/walnut mixture to mixture in the food processor and blend until smooth and all mixed well. Pour back into large bowl the carrot/walnut mixture was in and add raisins, mixing well. Pour mixture into a pie or cake pan. Blend the final 3 ingredients, honey, orange juice and cashews, in the Vitamix until smooth and creamy. Pour on top of the cake and refrigerate. Lasts up to 7 days refrigerated in airtight container. Big hugs and lots of love and blessings! Please be sure to leave your comments below and let us know what else you like to learn about. Read related: Ninja blender vs Vitamix.